Mind is the greatest of virtue by which a person’s capability and its capacity is depended. Mind is the only part which needs to be controlled in order to control the surroundings of human body. Often people tend to find it difficult to get in control their mind to a fixed place that is required. The distractions can be of various types and in order to overcome those distractions, one need to understand how to focus their mind onto the things which they are pursuing at the very moment. Today multitasking has become an important skill especially at work and as the work load is increasing day by day, it is becoming even more difficult to learn this skill. The very first thing needed for an individual to know are the things which are responsible for making their mind cause a distraction. Work over that distraction, even if how small or fatigue that distraction can be. By figuring out the problem which an individual lacks in it becomes a little easy to get over it. 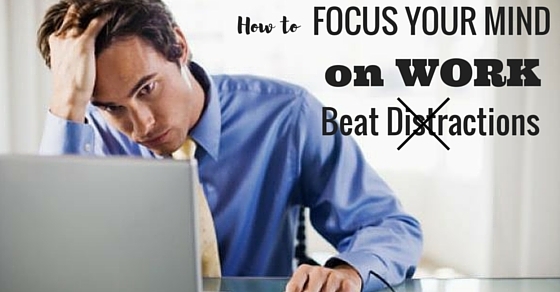 Distractions are a curse as it tends to distract the mind of a person and eventually their outcomes reduces. Try to resolve the cause which is causing the trouble or else minimize its effect as much as possible. By knowing the reason which is causing the distraction the very next step required is to understand how to plan accordingly such that the distraction no more occurs at the workforce. Planning will help in better understanding of what is going and what measures are required to be taken to stop the happening of the distraction. Planning for the day before will help in providing a vision of how that day should look like and that can solve a major problem. Timely checking the work make us more up-to date. Food is the utmost important need of any human being. A healthy mind will serve its purpose. Under any pressure or any rigid circumstances one must never skip any meal and should have food on time. This will help in keeping the body and mind of the individual active and he/she will definitely perform better. At the same time, one must not need more than required as it will inculcate feeling of dizziness in the person. Skipping meal often leads to various and serious health problems. Performing the entire task in once often becomes troublesome so one must divide the task in small nuggets and try to complete them one after the other. While preparing plans for the next day one should also get along with the work and dividing them into chunks if possible that will help in fast accomplishment of the task and help the individual to focus on one thing at a time. It will save time and work will also get completed without losing focus. Nugget helps in dividing the work and then working on it conveniently. In order to stay fit and fine, one must exercise on a daily basis. Regularly walking for a maximum of an hour can also be very beneficial for the health and their healthy mind will be more active and will work more efficiently. Meditation or performing yoga will help in better concentration of the mind. The more the mind will be in focus, the more the dedication an individual will give in her/his work. A focused mind will help in keeping control on all the senses. Constantly working under the screen sometimes lead to severe headache and irritation in the eye or causes back pain. One must take some time off for refreshments and constantly should keep switching to pen and paper from laptop and mobile. Tea breaks should be utilized thoroughly and timely breaks should be made and one should utilize the time by gazing around or walking alone and not merely by getting inside the smart phones. An active insider is the need most individual wants to be. Often it becomes quite boring if a person is doing the same task for the whole day. Boredom is a common issue that usually arises in such a condition. To avoid that recreation is the most pleasing part. One must devote time in listening to the music of our taste or just keeping the eyes closed for a few seconds. This will help in lowering down the boredom and the time he/she will again get back to work, they will be most charged up. Recreation helps in entertaining and keeps the mind refreshed. Often the most difficult part happens if a person lacks in keeping focus or concentration or interest, he/she is having from the work they are doing. If that is an issue one must not hesitate to switch out work and perform what they are best at. This will help them to give their cent percentage in the work as they will be doing this with full dedication. The passion that drives an individual will help him to keep his cool and concentrate his/her mind in the right place. Job should display one’s character. This is one thing an individual must follow in order to keep their mind focused. If the place they are working in is in full chaos it will be difficult to concentrate on other things. The place they are working in should be neat and tidy, this not only will help them to stay focused but rather be healthy for other employees working with them and will keep a healthy relationship amongst colleagues. An organized surrounding will help in better growth of the individual. Organized surrounding helps to grow the individual more. By setting up the priority of the work, one can know for a matter of fact that in which the maximum concentration will be needed. Giving priority to the task helps the individual to divide the time easily. This was by dividing the time the individual know what amount of time she/he will need for the completion of the desired task and how much efforts will be needed for its completion. The more focused that individual will be, if she/he knows the importance of that particular task. On encountering with any free time, one must devote it in something that leads to provide self satisfaction and peace and should avoid talking or listening to any gossip around. The time should be used truly by you without any interference from other. The more you become strict about your policies the more others will stop taking you for granted and what they think about you will eventually stop bothering you. While working during the office to pay full dedication, one must avoid using smart phones as they are the major cause of distraction. The distraction caused by the social networking sites should be avoided. One must get out of the habit of checking the phone every now and then for notification of worldly affairs. One must avoid such distractions and should fully concentrate only on our work and should only use the phone after the working hours. Taking snacks time to time helps in bringing back the lost energy and also helps to fill the empty stomach. One must drink at least 5-6 liters of water daily and should always keep a water bottle around the place we are working at. If one will eat something sitting over the same place they are working it will prevent the time of going around somewhere and hence will help not to explore other unrelated activities. Do something different from the mundane and get engaged often in the hobby that you are best at. Hobby will help them to keep them the individual active for the rest amount of time. Devoting time performing one’s hobby will help the individual to pay more concentration. A concentrated mind will be doing her/his job with full dedication without being distracted from her/his duties. Thus performing one’s hobby for a specified duration of time helps the individual to grow. Keeping things critically off for a longer period of time or not doing something unknowingly is something that is related to the distraction. The action of delaying work without any specific reason is often the cause of disinterest that an individual have from the work she/he is doing. One needs to understand the depth of the importance of the work they are doing and start not delaying work every now and then. This will help the individual to stay more stable and focused. The greatest of problems arises due to the mind not focusing on one problem at a time and hence getting confused with various problems and eventually not being prepared for anything. Every non-completed task brings the mind negative images that results in uninterested behavior of the individual towards their work. One must monitor the mind and keep it active so that it doesn’t wander around and stays stuck to the work it is prescribed to do. By recompensing it means one must reward oneself on completing the work on or before time. This rewarding will help the individual to boost self confidence within them and this will lead a point in performing better. To stay focused the individual must get engaged into anything that brings out the best in her/him. A little motivation can help the individual to go along a long way. One must be recompensing by giving delightful gifts on successfully completion of any desired task on or before time, as charity begins from home itself. By doing something productive one needs to get engaged into other activities apart from their workforce. Either that can be using the social-networking site for a while or switching to possibly an application in the phone. This switching is often required to break the boredom of mundane activities but again engaging too much is also devastating. Only for a specific time, one should be getting acquainted with these apps and after feeling refreshed should go back to the work. By being passionate towards anything we are doing help in growth and upliftment of the individual. A passionate individual will help the person stay more focused and dedicated towards whatever they are doing. They are obliged to perform their task with full determination that will eventually help the individual to help not to distract their mind in anything else apart from work. Staying happy doing our work is all you need for better growth of the individual. By being patient one can win greatest of battles. Keeping the mind in control is not an over day process it will take time but with full power and dedication one can accomplish this very easily. Focused mind helps in better performance of the individual and hence will make the person happier. Previous articleFlight Attendant Interview – How to Prepare for It?